Life should be chic, glamorous, and colorful - and so should your home. Ora Designs Owner Bri Hansen has had a passion for creativity since she was a small child. Her love for interior design began over twenty five years ago in her very own bedroom. From there it grew & grew and she soon became the design go-to for friends and family. 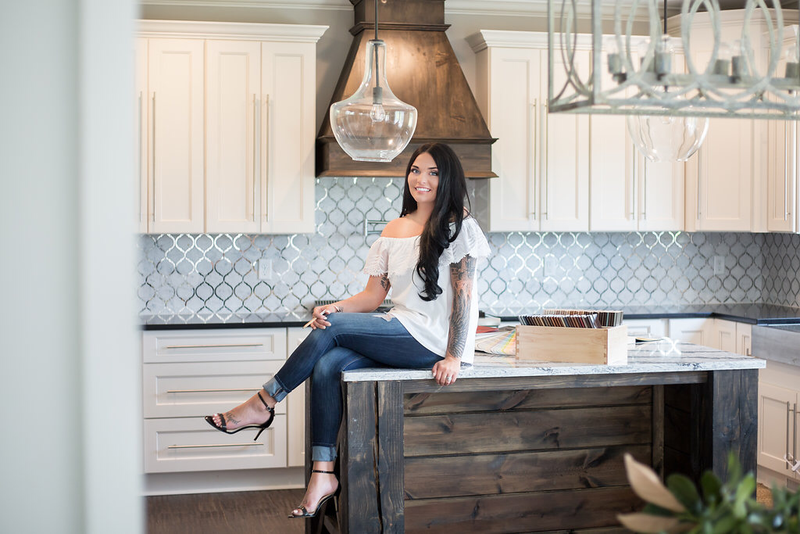 After completing her first "fixer upper" renovation on her former home with her husband, Devin Hansen, Bri's passion really blossomed. Her first creative accomplishment came in 2009 when she published her first book of inspirational poetry. Taking a break from writing she ventured into fashion in 2012 opening a clothing boutique in her hometown of Medina, Ohio, Posh Peacock. During her years owning the boutique she traveled to New York City regularly attending fashion & trade shows. Always bringing the very best and latest back to Medina with her. Although her boutique was a high fashion clothing store she still incorporated her creative touch. Bri collected old and antique furniture pieces and found unique ways to upcycle them and turn them into purposeful art. She incorporated them into the boutique as decor that was also for sale. The shop also had an entire wall covered in custom made wall decor that she created. After finding out she and Devin were expecting what would be princess number three, she decided to close her boutique, and spend precious time with her daughters. During that time she worked from home for her husbands company, Hansen Restoration. It was then that her love for interior decorating and design was reignited. She was working with home remodeling software everyday, as well as creating the designs for their own home build. She decided to continue her education and pursue interior design full time. Since then Bri & Dev finished their home, expanded their business's, and are currently expecting Princess number 5!! The two soon realized that the individual career paths could create endless opportunities if merged together. An interior decorating and design company along side a home remodeling company is a match made in heaven. This allows Bri to not only offer her clients incredible design service, but also all inclusive home remodels and renovations with Ohio's premier remodeling company. Avid fans of HGTV, Bri and Devin thought that Ohio could use a service like Chip & Joanna Gaines "Fixer Upper" and that's what they strive to bring to their clients. At Ora Designs we offer a wide range of services, as well as comprehensive and inclusive package pricing aside from our traditional hourly rate. We want our customers to be able to choose what best fits their needs. We don't believe in a one size fits all approach. We strive to tailor our services to accommodate each of our clients and their unique project needs. At Ora Designs we also believe in excitement, enthusiasm, and transparency. Deciding to change any area of your home is a very exciting time. We strive to make it memorable, stress free, and fun. We are absolutely thrilled to have the opportunity to work with you, and as such we treat your project with the same care we would our own. That means unrivaled attention to detail and sincere dedication to your project. Our goal is to not only make your space beautiful but also make it personal. A great home design should be a work of art showcasing the personalities of those who live within. If you're just looking for some direction we offer one time simple consultation appointments. We have full design plans for you to execute yourself at your leisure, as well as, fully inclusive luxe design plans that include everything from consulting, to shopping, to construction liaison service. So whether you're looking for inspiration, shopping service, design plans, or a complete fixer upper renovation, we have you covered. There is no job to little or to large for Ora Designs. If you're interested in more information please feel free to contact us! Join our VIP list for exclusive coupons and offers!